Winnipeg Kids Dentist Dr. Katie Davidson received her Bachelor of Science degree from the University of Manitoba in 2008 and completed her formal dental training in 2012, graduating with honours and receiving her DMD and B.Sc. (Dentistry) degrees from the University of Manitoba. She was awarded with the American Academy of Pediatric Dentistry (AAPD) Predoctoral Student Award and the Martin Nevile Award for outstanding work in the field of dentistry for children. 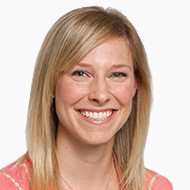 Katie has been involved in dental research with the Manitoba Institute of Child Health (MICH) and is an active member of the AAPD, attending many continuing education meetings to stay up-to-date with the latest advances in clinical dentistry. Katie has thoroughly enjoyed being involved in the past two All-Dentist Musicals, a theatrical fundraising initiative of the Manitoba Dental Association (MDA), taking on the roles of Sarah in Guys & Dolls (2013) and Inga in Young Frankenstein (2015). When not practicing dentistry, the former All-Canadian U of M Bison volleyball player enjoys running, cycling and golfing to stay active. Katie is always excited to welcome new patients to her practice!